Have you ever gone about your life thinking that everything was fine, that you had everything you needed to make you happy? And then, wham! !, you discover something that makes your life complete and you wonder how you ever lived without it. That happened to me today and I'm overwhelmed with emotion that I've gone through my whole life without Barb's Bacon Green Beans. But, now that I have have been enlightened, it is my mission to save my readers from their false sense of well-being. This recipe is from Gooseberry Patch's Homestyle in a Hurry, copyright 2010. In a skillet over medium heat, cook bacon until crisp. 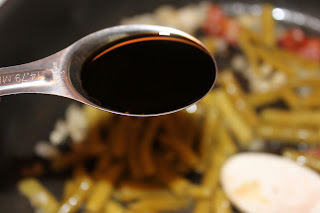 Drain most of the drippings, reserving one tablespoon in skillet. Add onion and garlic; saute for two minutes. 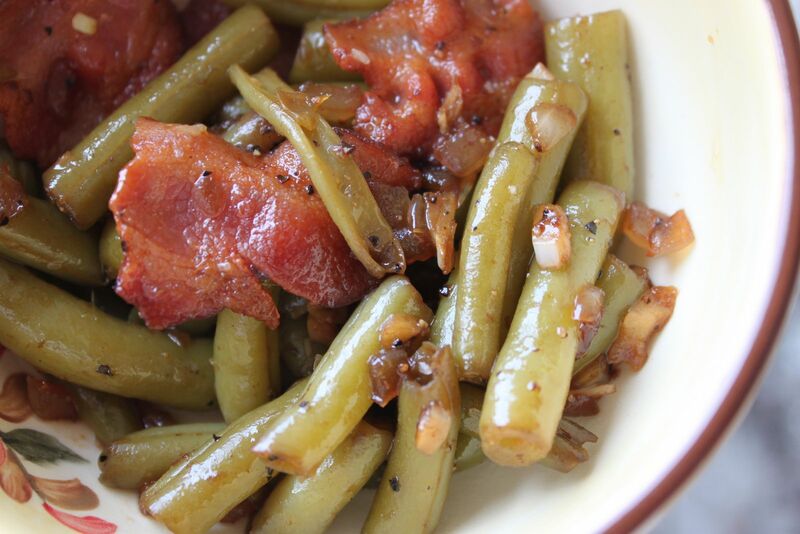 Add green beans and soy sauce to bacon mixture. Toss until coated and heated through. Makes 4 servings. 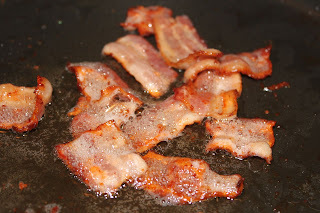 In a small attempt to eat healthier, I have made the huge change of using lower sodium bacon. I cannot commit to turkey bacon. Bacon is pork, period! I did drain off most of the fat. Just leave a little grease in the bottom for browning the onions and garlic. If the internet ever develops scratch-and-sniff, make sure you come back to this post. 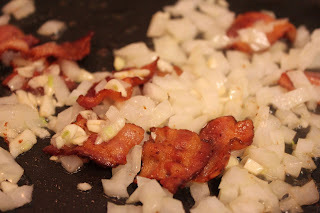 Nothing smells better than bacon, onions, and garlic!! Nothing!!! Add a can of drained green beans. I added a tablespoon of soy sauce. I also sprinkled in a little bit of black pepper. I cooked for a few minutes until the beans were cooked through. Barb, I don't know you, but I think I love you! 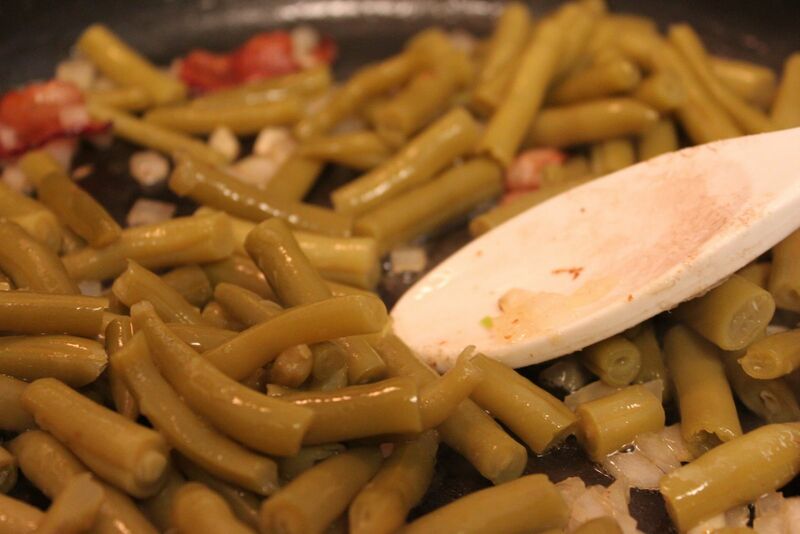 I do a similar recipe with fresh green beans in the summer. I can't wait to try this version with the canned beans. Then I can enjoy this all winter long, plus looks quicker. These beans are wonderful! I hope you'll give them a try and enjoy them. These are the best beans. My family enjoyed them too! A great addition to any dish! I can't wait to make these. Green beans are a regular weekly dish and this will be a nice change.